These carts are a portable and affordable option for irrigating a variety of areas. Each assembly uses heavy gauge steel construction, solid steel axles, and commercial grade full or part circle sprinkler heads. The Heavy Duty Sled Base Sprinklers are similar to the Jumbo sleds except that they are a little lighter and come with sprinklers that are more suited for residential applications. However, these sleds still provide you with a commercial grade quality product in a residential sized package. In addition to the already durable construction, the sled is available with a brilliant green powder coat baked-on finish or our hot-dip galvanizing process in which the sled has been submerged in molten zinc alloys to form a non-corrosive, scratch and rust resistant barrier between the steel and the wet environment in which it will be operating ensuring years of trouble free use. 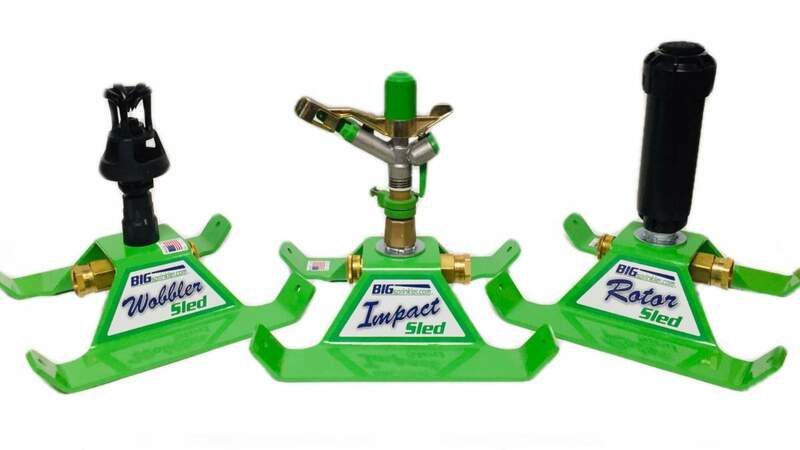 These sled based sprinklers are designed to work with flow rates and pressures typically found at your homes garden hose spigot and can be connected to a standard 3/4" garden hose. We offer three sprinkler head options to best fit your irrigation needs, the Impulse, Rotor, and Xcel Wobbler sprinkler heads. Our Jumbo sled base sprinklers have a sturdy base to help you get ultimate coverage. We built them to withstand years of use and tower over most store-bought sprinklers. Components include heavy steel water path components, heavy brass hose connections, and 1” impact sprinkler head or 1” Rotor head with additional nozzle sizes for different flow rates. These are a great choice when you need a sprinkler that can rise over flowerbeds and gardens for general use on large areas. They come with weighted legs to help with stability while in use. There are 3 different sprinkler head options to fit your application. This is not a sprinkler you will find in local stores. This commercial grade quad stand is made for larger sprinklers with up to a 2” inlet. The adjustable legs allow for leveling in loose soils condition or uneven ground for stability. Optional quick connect adapters for the sprinkler heads are also available.